A lifestyle boutique hotel designed by the iconic French Designer Philippe Starck, M Social Singapore makes a pretty quiet getaway from the bustling life in Singapore’s urban areas. 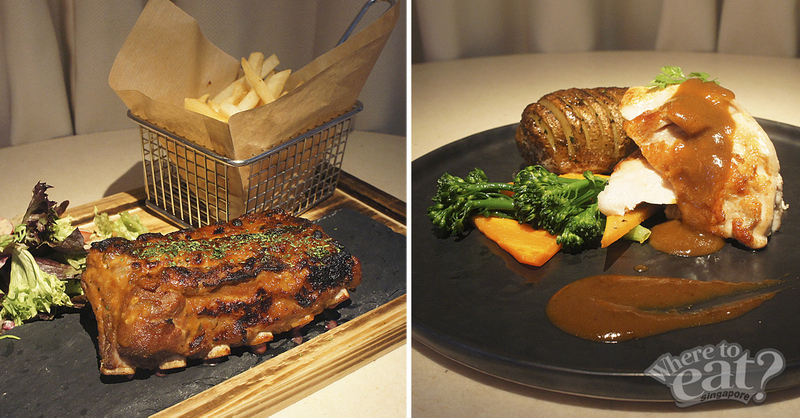 Lying within M Social is an East-meets-West fusion restaurant, Beast & Butterflies. Its straightforward yet cozy atmosphere gives off modern techy sentiment with its interactive tablet displays and an accidental meeting of Aura – M Social’s room service robot at the lift lobby. 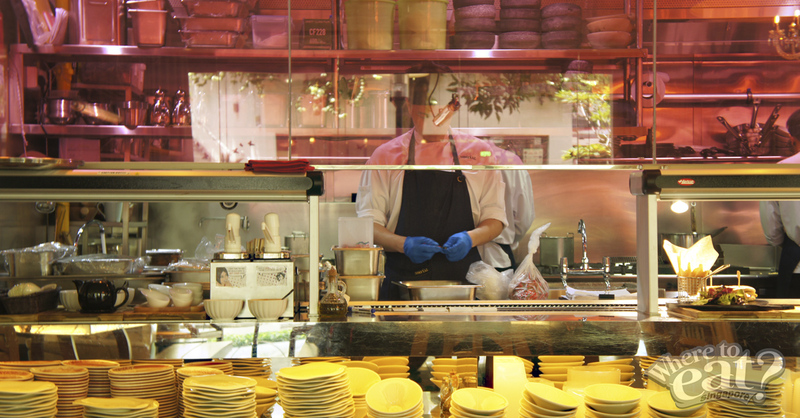 Helming Beast & Butterflies’ kitchen is Bryce Li, its Executive Chef, who is seen as someone well-dedicated to his craft. 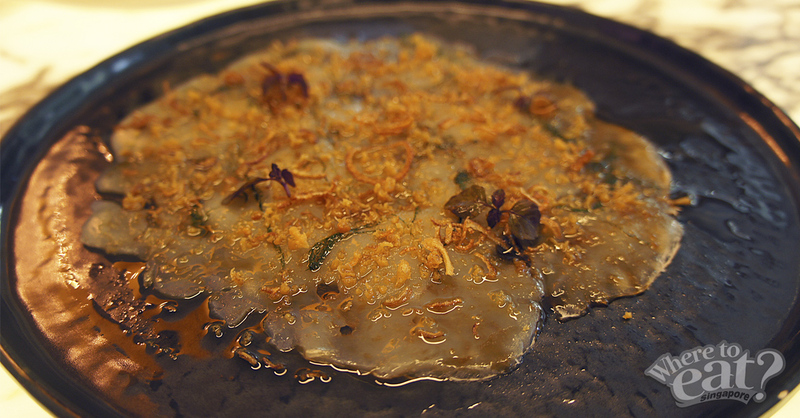 We started off our afternoon with the Hokkaido Scallop Carpaccio, which we must say was a pretty light and tasty appetizer that whetted our palates – getting us ready for the following dishes to come. Dressed in yuzu and ginger marinade, the fresh scallops left a delicate and sweet taste with the fried shallots contributing to a little crunch to the dish. 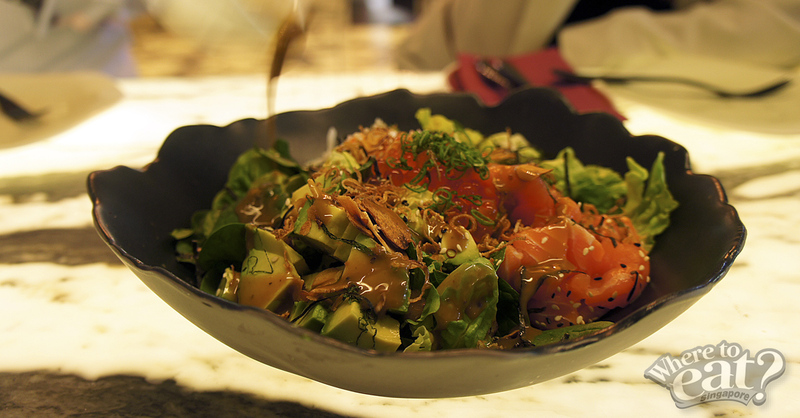 Next up was yet another inviting appetizer – the Poke Salad. It felt very much like a Japanese dish with its ingredients (Ikura, Salmon Sashimi, Crab Meat) and the Kani Miso (Crab Brain Paste with Miso) Wasabi sauce. It was a tad disappointing for the sauce however, as we’d expected a slightly spicier kick from the Wasabi. The main essence of the afternoon session was the Teochew-style Lobster Porridge. It may seem watery, but its broth is not something that you should belittle. 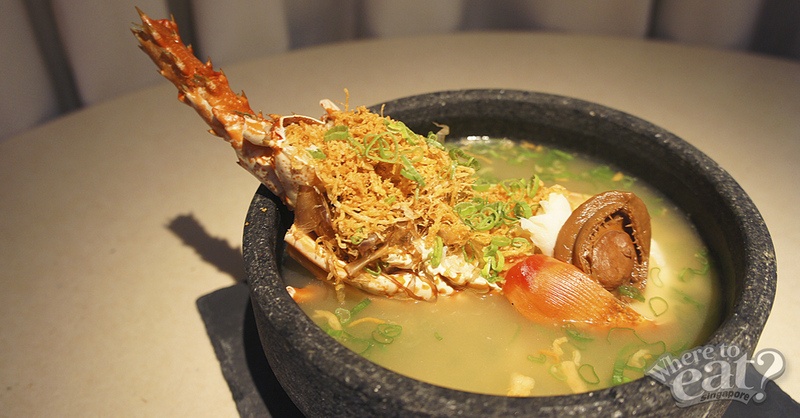 Brewed for at least 8 hours, the mub crab broth leaves a sweet lingering taste in your mouth afterwards. Akin to a key ingredient in the Lobster Porridge, the thinly sliced ginger further enhanced its flavor. 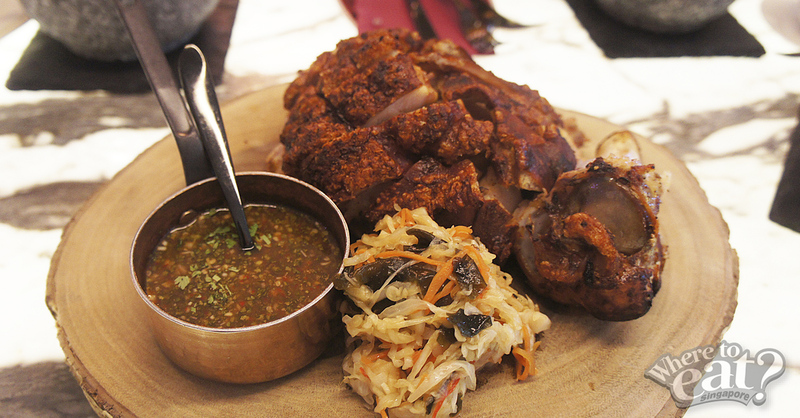 Following on was the Ham Hock, an Asian-Western Fusion dish starring crispy German Pork Knuckles, Thai Nam Chim sauce and Asian Sauerkraut. Drench the Pork Knuckles in the slightly spicy but not overwhelming Thai sauce and hear a crackle as you bite. We think that it’s no mean feat to have such crisp skin yet tender and juicy meat. On the other hand, the Asian Sauerkraut, tasting similar to Chinese Preserved Vegetables, seemed like an quirky companion to the Ham Hock. Although the Indonesian Baby Ribs were eminently tender with its glaze leaving a heftier taste, it fell short of our expectations for a fall-off-the-bone texture. The Grilled Chicken Breast has extremely tender meat – with a little pink on the inside. Such texture was achieved using the Sous-Vide style – a cooking technique that many high-end chefs use to deliver juicy meats. Grilled to almost perfection, its skin is fatty and juicy. 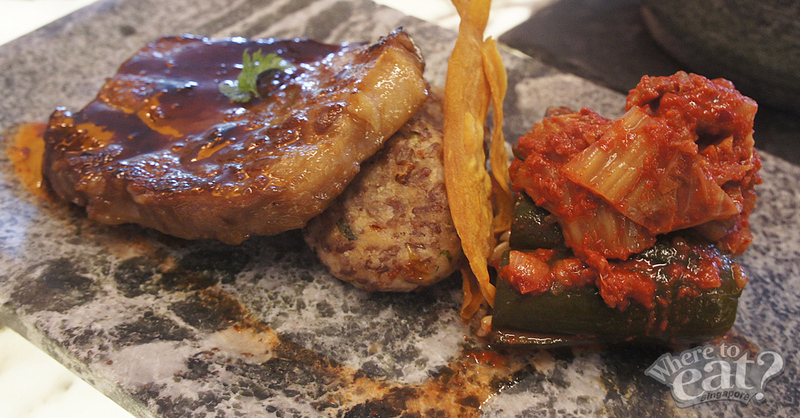 The last main dish that charmed us was the BEASTLY delicious Grilled Mangalica Pork (Wooly Pork) Collar with scallion brown rice, kimchi cucumbers and bulgogi sauce. According to Bryce, the Wooly Pork is the “Wagyu Grade” of Pork and we can’t seem to find any flaws to disagree on that! 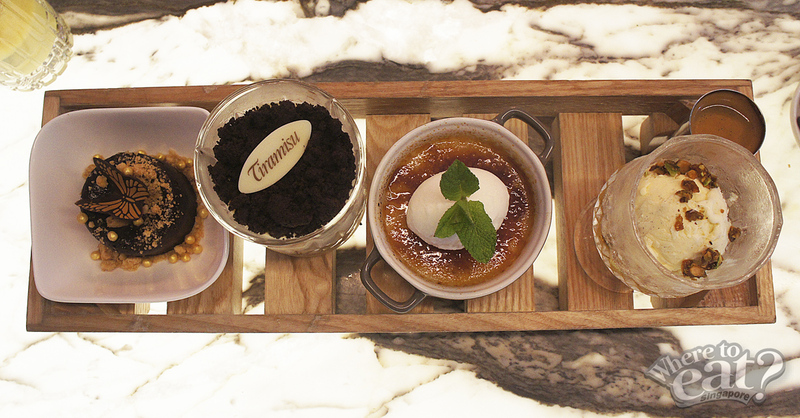 To end the session, we were presented with a tray of desserts: Chocolate Lava Cake, Tiramisu, Yam Creme Brulee and Affogato. The Chocolate Lava Cake is immensely rich that melts in your mouth, with the crumbly biscuits adding a nibble to it. An interesting East-meets-West fusion dessert that left us nodding our heads was the Yam Creme Brulee. Tasting similar to an Orh Nee (Yam) dessert, expect a Western twist with its accompanying Coconut Ice Cream and its melted sugar crust top. But our favourite vote goes to the Tiramisu dessert that was yummy and rich! A little surprise came at the end when we were presented with a cup of coffee that has our picture on it! If you are looking at a quirky yet quiet environment to dine at, the Beast & Butterflies at the M Social is the one to go on a date. We hope to explore more Bryce’s new inventions and M Social again!